Let me start with the first one i.e. Using command line. I will use this method to add Eclipse IDE under Applications–>Programming–>Eclipse. If your Programming sub-menu is not present already it will be added automatically. a) Open the terminal (Applications–>Accessories–>Terminal). b)Now type the following command in it. This will bring up a blank text editor. Paste the following contents in it. Here I have used Exec=/usr/project/eclipse/eclipse which is the path to the eclipse executable application and Icon=/usr/project/eclipse/icon.xpm which is the path to the icon. c) Save it using Ctrl+S. Close the editor. This will add Eclipse in GNOME menu. Now let me come to the second method i.e. Using GUI settings. The Menu editor will appear . In the left panel select the category like accessibility, Debian, accessories etc. The right panel will update with the entries in that category. Another dialog will appear, thats where you will make the actual entry.In this case I will add a Firefox entry. First of all select what type of application it is. You can select application or application in terminal, both are quite self explanatory, you can also select a file. Fill name with the application name or whatever you want. 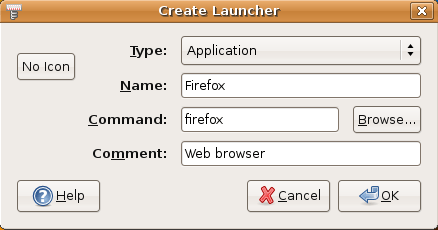 Fill command with the applications command, in this case its firefox. If you selected file in the first box instead of application, you can browse for the file or just add the path to it. Comment is rather self explanatory.Now, select an icon by clicking the button to the left, in this case since i haven’t selected one yet It says ‘no Icon’. Hit the ok Button that’s it. If this information is helpful to you or you need more help please post a comment.